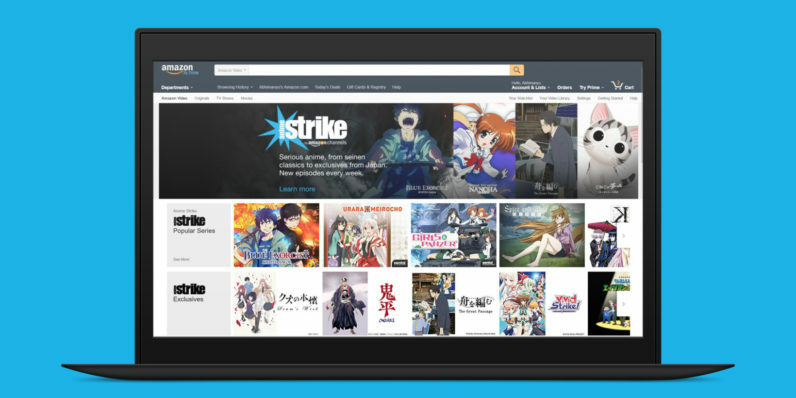 Amazon has launched Anime Strike, a new branded channel that will let you stream anime shows and movies on-demand for $5 a month. It’s only available to Prime subscribers in the US for now. Anime Strike joins the company’s lineup of add-on Channels that you can subscribe to for a monthly fee and stream through Amazon Video. It’s the first of Amazon’s own channels; the others on the platform include Showtime, Starz, Tribeca Shortlist, Seeso and HBO. The new channel offers a range of content with more than 1,000 series spanning classics like Paprika, Tokyo Godfathers and Magical Girl Lyrical Nanoha StrikerS, as well as more recent series like The Great Passage, Scum’s Wish (“Kuzu no Honkai”) and Blue Exorcist: Kyoto Saga (“Ao No Exorcist: Kyoto Fujouou-hen”). Amazon told Variety that it’ll refresh its content on a weekly basis. The company also plans to launch more such branded on-demand channels in the future, but it isn’t clear which genres Amazon has in mind just yet. If Anime Strike sounds like your idea of a fun night in, you can try the channel for a week at no charge by signing up here, provided you’re a Prime subscriber.